Rachel Von | The Journal Gazette The TinCaps' Aaron Leasher pitches during the first inning against the Hot Rods at Parkview Field on Tuesday. 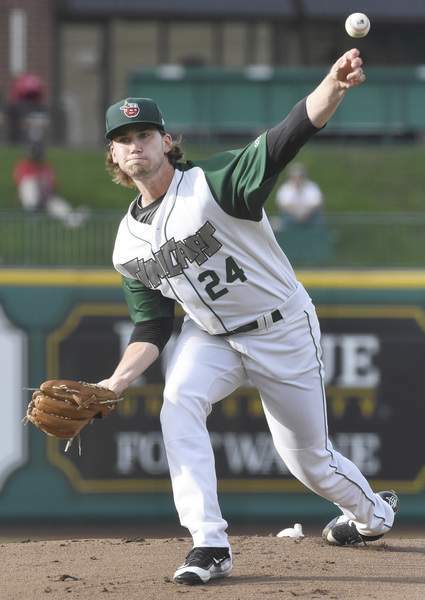 The TinCaps have won four games in a row and they did it on Tuesday with pitching and defense. Aaron Leasher got through six innings, giving up only one run to get the victory, while the defense behind him helped repeatedly with well-timed glove work. Leasher gave up six hits and walked three and clearly did not have his best stuff. That he was able to put together a solid start anyway is a testament to how well he's pitching right now. "Those are the games that kind of show us a little bit more than just the dominating outings," manager Anthony Contreras said of Leasher's start. "It's like, what can you do when your stuff isn't all there. How can you still get guys out and do your thing? He competed. To give us six (innings) when you don't have all the stuff there is big time." The defense provided plenty of help. Jeisson Rosario made two key running catches in center that saved a run and also threw out a runner trying to go from first to third on a single. It had to be a perfect throw and it was. Catcher Jalen Washington picked a runner off first. Gabriel Arias and Esteury Ruiz turned a nifty double play up the middle, with Arias spinning and scraping the bag with his foot all in one motion. Fort Wayne didn't commit an error. "I was a defensive guy when I came up (in the minor leagues), so I have a lot of pride in that," Contreras said. "We're working on the small details of our defense and it's starting to translate over into the field." The TinCaps didn't get much from its offense, but it got enough, with the team's youngest players at the center of the action. Luis Almanzar had his first extra-base hit in 12 games with a double down the right-field line that plated Gabriel Arias in the fifth and Justin Lopez followed with a controversial two-run home run in the sixth (though it was the correct call). Almanzar, Arias and Lopez are all 18 years old. Outside of those two rallies, the TinCaps were quiet on offense, but it didn't matter because the pitching and defense were so solid. This team has been solid for four straight games, doing what Contreras likes best: making the simple plays. They haven't needed anything too flashy to win these games. Now Fort Wayne has a chance to sweep a team that had the best record in the league in the first half. They're currently only a game out of first (I know, I know small sample, etc. ), when at this point in the first half they were already 0-6. It will be interesting to see if they can keep this up on the road, but this team is fearless at Parkview Field. "We're having fun," Leasher said. "We're playing the game the right way, playing with a lot of energy. Everyone's feeding off each other's energy and just enjoying it."